When the automobile and super highways converged on our culture in the 1950s they didn’t only create another means to travel, but another means to eat. Because the automobile quickly became a substitute for the kitchen table and when we got a few million miles under our belt we started to think maybe there was more to do in the automobile besides drive and look at the scenery. That’s when fast food restaurants began serving up our meals via drive thru windows. It was convenience and ease of service we were after and companies such as McDonald’s wanted to make our lives as easy as possible. The only problem was – and still is – the sloppiness of the food they serve. A hamburger box is too bulky to hold onto while steering the car and flimsy wrapping paper isn’t much better. 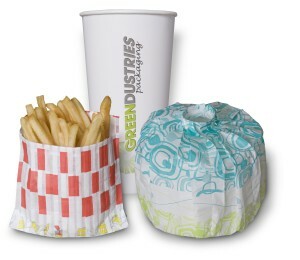 So today, fifty years after cars started to dominate our lives, GreenDustries introduces fast food packaging that is practical and has functionality. And it doesn’t take a genius to understand why there was a vital need in the fast food industry to have consumers enjoy their food and stay clean at the same time. In fact, cleanliness is probably as important a priority as satisfying hunger. It also equates to store profits. When looking at research and what the customer wants in the way of fast food it seems the customer wants containers and packaging that are easier to handle, will keep the product hot, is environmentally safe and visually appealing. When ordering at the drive thru in nice, clean clothes in a clean car the customer limits the menu choices of what they know they can eat in the car to prevent the mess. We know that the more expensive hamburgers, with higher profit margins, is loaded with tomato and lettuce and sauces while the less-expensive plain burgers and chicken nuggets are not. The food choice is determined by the dribble potential. It’s more than just getting through the drive thru fast; it’s also about convenience meal solutions and practical packaging. GreenDustries PleatPak™ and Magic Bag™ products offer convenience and ease of use while eliminating the sloppiness factor. A unique design that allows the user to pull back the wrapper with every bite ensures a satisfying meal experience that won’t end up in your lap. So you can have your burger … and safely eat it, too. Hi Mr or Mrs Javierollie. Thank you for your post. Come back to read more subjects. We have our product witch are totally “green”.We trying to change the Fast food Industry to a clean environmentally friendly industry. 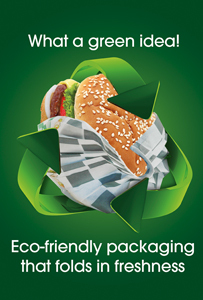 Our PleatPak and Magic Bag are the Greenest of the Green Packaging & the Champion of the 3″Rs” REDUCE, RECYCLE, REUSE! We will provide the blog this week with a E-mail subscription link or a e-newsletter! I absolutely love the theme on this webpage. Would you let me know where to get it? Thanks a lot! We’re a bunch of volunteers and opening a new scheme in our community. Your web site offered us with useful info to work on. You have performed an impressive task and our entire neighborhood might be thankful to you. We designed all our Social Marketing ourselves with our own team also our website. I’ve been in the same situation before. It’s not as easy solution as you think it may be though, it is something that you’ll have to write out for yourself over time. You totally right! Thank you. Hi Shea, http://www.greendustriesblog.com, look for much more…. Thank you. Hi Jose, you need to go to : http://www.greendustries.com to really get what we do…. For more blogs : http://www.greendustriesblog.com. Thank you! Hi Maura, Thank you ! Hi Luigi, please go to : http://www.greendustries.com, to understand our story! Or at : http://www.greendustriesblog.com, for more blogs. Thank you! Thank you Tobias! http://www.greendustriesblog.com or http://www.greendustries.com.